I'm so far behind in everything & I'll be so happy when this hectic week is over! I did enjoy the field trip yesterday....we had a LOT of fun & I'm sure Brandon will carry these memories with him for the rest of his life! I have a really quick post for you today. This is a card I made just to see if I could still make one LOL! I didn't use any sketches or challenges; just made a card out of the pieces of paper I had sitting on my table. Not bad I don't think but I'll let you all be the judge! Brandon has his awards assembly today & I have class tonight so I better get rockin'! Thanks so much for stopping by and have a great rest of the day!! Pretty. The Dazzling Diamonds add such a nice touch of sparkle. Oh this turned out so pretty! 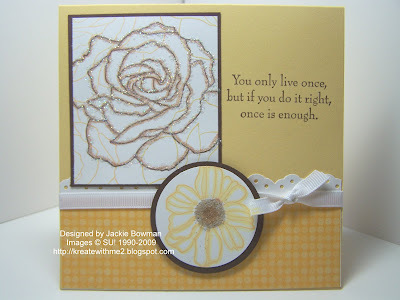 I have not seen this done with yellows and it really is lovely! This is really gorgeous! I love the background of the flower! one if my favorite stamp sets - gorgeous job! So cute Jackie!!! I love that stamp set! So very pretty, Jackie! Love all the yellows! Love this sunny delight, Jackie!! Great job on using scraps off your desk. I like the sunny colors you used. I think you did a fantastic job! Love that rose!! This is gorgeous! I love the sparkle on the big rose. I really like the monochromatic scheme as well. Don't you just LOVE using the scraps left on your table? This makes me soooo happy! And you did a fantastic job with yours! I know what you mean about a hectic week! This is a beautiful card! I love that you used everything that is out. And I love the glitter on the flower. This is gorgeous. I just love it. Have a fabulous weekend. Pretty card. I need to try this glitter technique. This is a fabulous card, Jackie!! I love it! What a beautiful job! I love the yellows and the sparkle. Beautiful card!!!! Hope you have a wonderful night!!! This looks so pretty, Jackie! I love all the yellow! Beautiful Jackie. Field Trip sounds fun. We missed you on Twisted Thursday. Will you be participating? What a lovely color choice! I love the edges rimmed in sparkle, it makes this so elegant! Love how you did the flower - very pretty. This is beautiful Jackie!! Love the edges and the yellow!! gorgeous work! this is beautiful! I love the colours! This is lovely! Love the glitter! Super card, really like the yellow! Gorgeous! You can definitely still make them without a sketch or challenge. I might have to try this! I love this stamp set and this card is gorgeous! The glitter is the packing punch!